Oliver Nicholls has achieved an improbable feat and has become the first Australian student to be awarded the Gordon E. Moore award at the Intel International Science and Engineering Fair (Intel ISEF) 2018 in Pittsburgh, U.S.A.
His original and innovative autonomous robotic window cleaner for medium rise buildings impressed judges with its creative use of technology and the application of an in-depth knowledge of mathematics, physics and the design process. 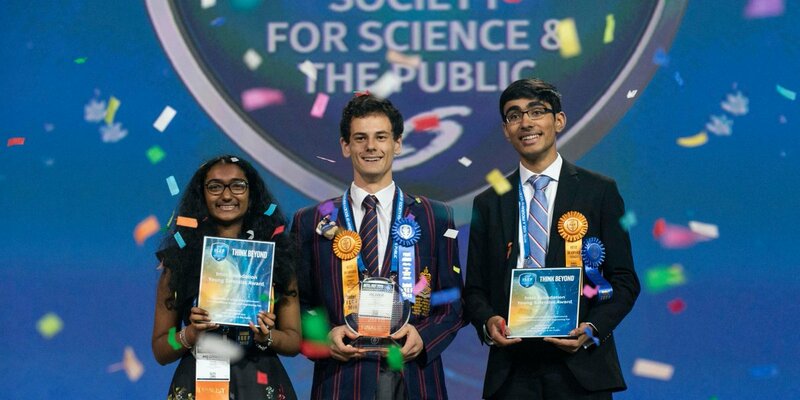 The Gordon E. Moore Award of $75,000 USD recognises the Best of the Best among the outstanding students from around the world who participate in the Intel ISEF. The finalist with the winning project is selected on the basis of outstanding and innovative research, as well as on the potential impact of their work on the field and on the world at large. Watch the video below to see the raw excitement amongst his teammates when his name was announced! The videos below show his window cleaner in action, as well the design process he followed. Oliver’s path to ISEF began years ago when he first began entering the Young Scientist awards. He was a prizewinner in 2014 with his model of a pulsar star. Oliver’s 2017 project was also entered into the national BHP Billiton Science & Engineering Awards (BHPBSEA) where he won First Prize in the Engineering. The video below formed part of his application for the BHPBSEA awards.